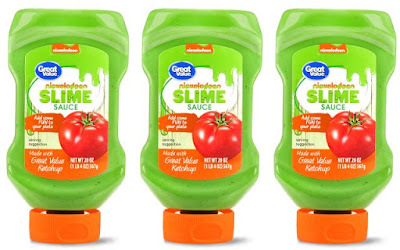 Walmart gets into the colored-ketchup business with the introduction of new Great Value Nickelodeon Slime Sauce (AKA green-colored ketchup). Green slime is associated with Nickelodeon when it was introduced on a show called "You Can't Do That on Television" in the '80s. Walmart's take on the green substance can be found nationwide in 20-oz bottles for $2.28.